Money – it’s a big deal everywhere, especially now, and as Egypt has many people living below the poverty line it’s certainly a big deal in Egypt. The Egyptian currency is the Egyptian pound (EGP) or Livre Egyptian (LE) which is worth 100 piasters. Notes are in denominations of LE 200, 100, 50, 20, 10, 5 and 1. Coins are in denominations of 50, 25, 20, 10 and 5 piasters and LE1. 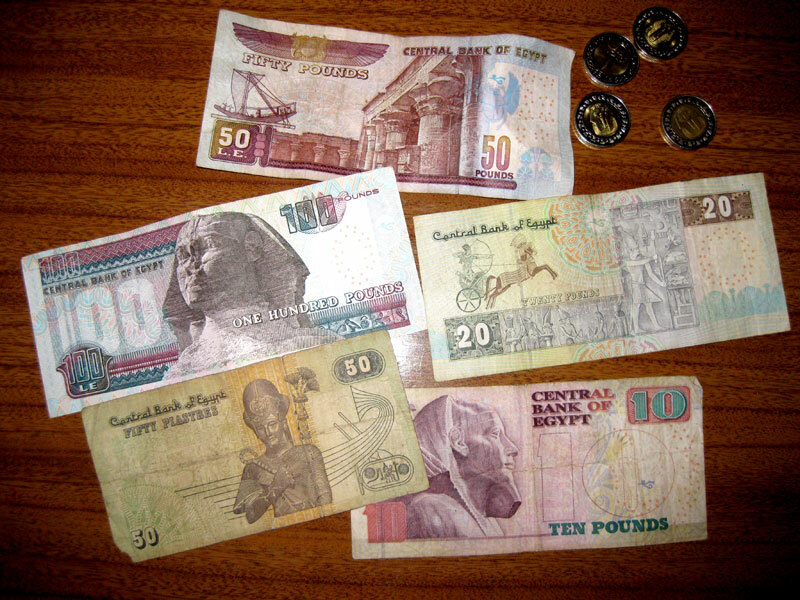 Many small shops and local businesses will only take Egyptian pounds. It’s always good to have some, especially small denominations, for tipping as well a for emergencies. MasterCard, Visa, American Express and Diners Club are widely accepted in Egypt. All hotels, major restaurants and shops accept credit cards. It is advisable to take travellers’ cheques in US dollars, pound sterling or Euros to avoid additional exchange rate charges. ATM machines can be easily found in all major cities and tourist spots. The banking hours are usually Sunday to Thursday, 8.30 am to 2 pm. Friday & Saturday are off. This is for government banks. Private banks are open until 5.00 pm Sunday to Thursday. Most hotels have some money changing facilities or are located close to a currency exchange or bank. The major currencies accepted are US$, GBP or Euros. It may be difficult to exchange other currencies. Egypt is a country whose workers rely heavily on tipping to augment their wages. You can expect to tip for every service, including the man or lady in the bathroom (toilet) when they provide paper for you, drivers, guides, porters at the airport (even if they only lift your suitcase up and pretty much put it straight down again – be firm in saying no thank you – “la shukran” – if you want to manage your own luggage), everyone you come in contact with and who does something for you. (I live here and tip everyone – the postman, the man who packs my groceries, the doorman, the bathroom attendants, the man who fills up the car with petrol or washes the windscreen, taxi drivers etc. etc.). One pound is enough for a small service, for larger services it’s what you feel comfortable with. However, if you are on a tour or cruise, save your tipping for the end of the trip and then tip a more substantial amount, unless you have a different driver or guide each day. Then tip at the end of the day. Your driver, for example, will only earn a wage of around 300 pounds a month so tipping is important, even if it’s not in your home culture. You can also tip your favourite bar staff or waiters or those who have really looked after you, not necessarily everyone.